Here is a list of changes made to each version of CMUD. The most current version of CMUD is listed first. Added option to Room Configuration in mapper to match a partial room name. Room matches if the name from the server (or via GMCP) matches the first part of the name already stored in the mapper. For example, allows "Roomname" to match "Roomname (G)" already stored in map. Improved how Reformat handles nested #IF and other block statements. It doesn't try to cram stuff all on one line anymore. GMCP no longer uses Room.Info.Brief as room description. Room.Info.Desc is now used. Fixed problem with GMCP data not overwriting existing key values. New v3 License Key required for this version. See Upgrade instructions in the forum. Added: %url function to return a zApp zWeb component (Params and PostParams properties are a bit different though). More documention coming soon. Fixed bug when no key follows a dot. String values containing numbers are properly respected as strings in lists/tables. Leading zeros in string are preserved. Remove syntax checking option for Text windows (non language specific) in the Text Editor. Prevents ANSI colors in loaded text from being lost. Added support for individual *.lang language files (same format as languages.ini) for adding custom languages without disturbing the main languages file. Added GMCP Trigger type to fire triggers on matching Module.Package.Message strings. %gmcp.module, %gmcp.package, %gmcp.message, %gmcp.data, %gmcp.olddata variables available within trigger. Changing sort options no longer forces new value to be saved. Added new "AllowNulls" argument to %numwords, %words (3rd argument after the delimiter value). If set to non-zero, then multiple delimiters will be merged into one. Useful for handling words separated by multiple spaces. Added support for access "by reference" for %additem, %delitem, %addkey and other table/list %functions where list can be directly manipulated by omitting the @ in front of the list variable reference. #delitem (and many other commands) now properly handle the %key variable, as in "#delitem var.%key value"
Fixed problem with json parser treating strings list "1of2" as a numeric value of just "1"
The "Update main icon with status" option is now window-specific instead of global. True by default. Added support to pattern wizard for "not in list" and "not in range"
Changed "stack frame corrupted" error message to "Runtime error in script. Use the script debugger to find problem"
Check for New Version now runs in background thread to prevent hanging of session when there are proxy problems. Also updated proxy help message. Added: New #SQLDB command for defining an SQL database connection. Documentation to come. CMUD limited to SQLite databases. CMUDPro and TeSSH can specify a wide range of database driver types for remote databases. Added: New %sqldb function returns a database COM object as with #SQLDB but allows properties to be changed before connecting. Returns a zApp zConnection object. Added: New %sql function performs an SQL query and returns the resulting "row object". Returns a zApp zQuery object. Documentation to come. Mapper no longer sends the longest direction for doors. The first direction in the direction Command string list is now sent instead. Added: SO_KEEPALIVE socket option to keep telnet sessions from timing out in routers (enabled by default). This does not circumvent MUD-specific idle timeout code. It is only used to prevent routers from dropping idle telnet socket connections. 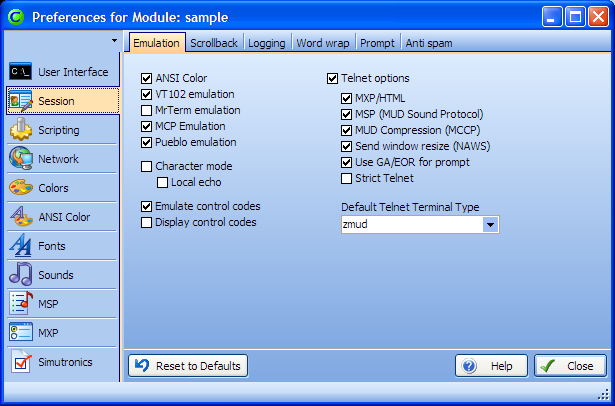 Improved tab captions in Editor to indicate files being modified via FTP or MCP. SSH: Fixed issue where an error could be reported when sending data after a connection was closed. Improved button alignment options in editor. Instead of using negative values, there are now radio options for setting the button alignment. Added: User-defined styles via #STYLE and #NOSTYLE command. Color commands (#CW, #COLOR, #PCOL) recognize the name of a style in place of a color name. Styles edited in the Preferences dialog, or by adding View/Show/Styles in package editor. Mapper no longer loads zone-specific configuration files. Should prevent unwanted configuration changes or loss of configuration. The #config command can still be used to load alternate configuration files from within a script. Added internal EOR/GA flag. When EOR/GA is detected from server and the EOR/GA preference is enabled, prompt triggers will only fire on lines that end in EOR/GA. Added: #UNLOAD command to remove a package from the session. Lua: zs.param now returns nil if a parameter doesn't exist, instead of zero. Telnet: Telnet options now use a separate client and server state information to make the telnet option negotiation process more standards compliant. Telnet: Scrollback buffer is properly preserved when clearing the screen (such as when loading the vim editor), allowing you to scrollback and properly see the text that was received before the editor cleared the screen. Telnet: TESSH now defaults to xterm emulation mode instead of vt100. Fixed problem causes by some sessions getting their username/password fields crosslinked so changing the name/password for one session was also changing it for other sessions. Fixed minor problem when pressing Tab key from menu item name where it wasn't focusing the script field next. Fixed problem with spaces getting stripped when using multiple variables at the beginning of the command line. Such as "@cmd @target"
Added right-click menu to the new Compass buttons to add, remove, edit the links in the different directions. The speedwalk #OK triggers are now created within the new Map object in the session package. Each Location object has it's own #OK speedwalk trigger, which is enabled and disabled as you speedwalk. The old mapper deleted and re-created the trigger, so this is a big speedwalk speed improvement.